Let me start by saying I know nothing about tractors (probably mistake #1). We just bought a 5 AC parcel and need a tractor for general work (upkeep on gravel road, post holes for fencing, cleaning animal stalls, light grading around property, on and on and on). I stopped by a Kubota dealer and was talking to him about his tractors. One thing he mentioned to me is that on the models I was looking at, you were not suppose to use the front loader without another attachment on the back because you need the weight of the attachment for counter balance. I'm not sure if this was a sales tactic or reality. I was looking at the 21-24 HP range units (B7510 was one model). The question I have is "Do all tractors in this range have this requirement or do only Kubotas or was he just blowing smoke?" Also, can anyone point me to any articles on comparisons in this range of tractors. He is not blowing smoke. You need a counter balance. When you lift the weight in the front up, after a certain point the center of gravity shifts. I usually have a shredder or boxblade on mine and it seems to do the trick. If your using a loader be careful until you know what your tractor will do. All tractors regardless of size will topple. I'm sure some of the other guys on the board are much more experienced than I, and can relate some information. A Deere 790 or the Kubota 7510 are both good prospects. If you can get ahold of a FEL operator's manual; it covers the required rear ballast requirements for the tractor. I am not sure but Deere may have the FEL operator's manual's online on their website. I checked and only the ag type FEL's are on the Deere website. Sorry. The manufacturers haven't found a way around the laws of physics. If you lift a big FEL load the CG shifts forward. If it shifts far enough forward you'll end up on your nose. An often used alternative to adding a rear implement is to load the rear tires with a liquid solution (CaCL, Rim-Guard, windshield washer fluid) to add counterweight. Whether or not this will add enough weight depends on the chosen model, loader, and bucket and the size of the rear tires. Whether or not it's a desirable thing to do is another debate entirely and depends on your uses for the tractor. There are folks on both sides of that issue. A box scraper is an excellent ballast as mentioned and the 7510 series is small enough for many barns to manuver in for easy clean-up. I'm not sure if brands other than Deere offer a 3pt. weight box option for their front loaders. In most cases it seemed to make more sense to me to put the weight box money toward a box scraper, then you have your rear ballast plus a useable piece of equipment. Enjoy your day. Frank. As mentioned by others - it is always good to have rear weight while using a loader. Options are filling the rear tires with calcium solution, and/or rear wheel weights,and/or a weight box, or a rear impliment. A rear weight box welded up to attach to the 3pt hitch could be made by any welding shop - just fill with gravel/sand/rocks or whatever. 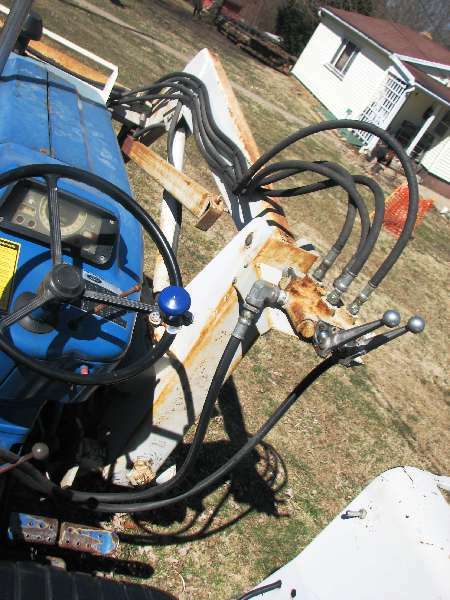 There are some things to think about when ballasting a tractor with a 3-point mounted implement or ballast box. That weight is directly on the rear axle housing, axle, and bearings when there isn't a load in the loader bucket. Rear wheel weights and filled tires do not induce this stress on the rear drive system when the loader is empty, but induce a couterbalance force through the axle and housing when the bucket is full. Rear wheel weights can be removed (as an implement or ballast box) when the couterweight isn't necessary. It's strickly a matter of preference, the most important thing is to properly balance a tractor for safe operation. That usually means about 60% at the rear axle, and 40% at the front axle. There is a larger variation for 4wd tractors. Most operators manuals will describe proper ballasting. An adavantage to putting fluid in the tires is general stability. The compacts are light enough that they bounce around alot when mowing or bush hogging. Fluid in the rear tires really helps smooth things out.